This thread adapter will fit onto 13/16 x 20 TPI. This is the same thread as used on all Volquartsen barrels that have compensators installed on them. 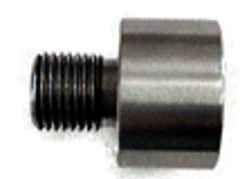 The adapter features 1/2 x 28 TPI (same thread used on the majority of sound suppressors). The adapter is ideal for Volquartsen lightweight THM barrels where threading the barrel is not an option due to its design. Adapter is available in Stainless Steel or Black.